Consumer price inflation eased back from the January spike, silencing concerns that inflation would soon make a comeback. This will help keep the Fed focused on its gradual tightening path. If they want to shift gears, they will have to look elsewhere. Core CPI decelerated in February to 0.2 percent month-over-month, compared to a 0.3 percent gain the previous month. The annualize monthly gain was 2.2 percent. Be wary of reading too much into the three-month gain of 3.1 percent as that will quickly come down if the monthly readings stay low. It is worth considering that the stronger December and January numbers reflected some unaccounted for seasonal factors. Given the low inflation environment, the numbers of times firms change prices during the year decreases, and the timing of those changes are concentrated around the beginning of the year (a natural time to change prices). If so, then the December and January numbers were largely transitory. Two additional points in this quick post. 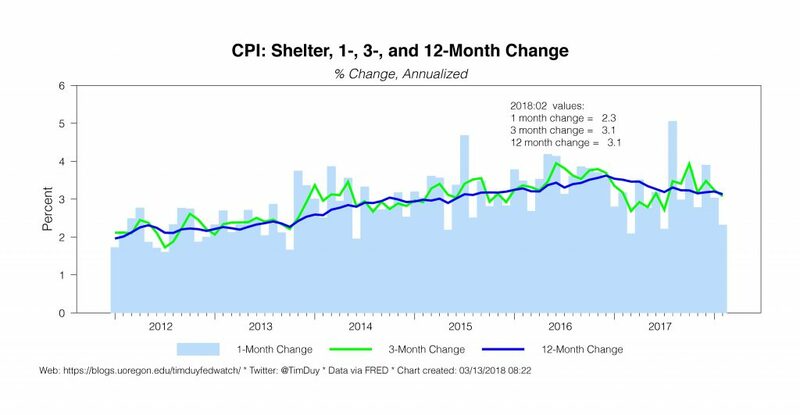 First, with multifamily housing starts holding strong, gradually declining shelter inflation will likely continue to weigh on overall inflation. Second, PCE inflation, the Fed’s actual inflation target, traditionally runs roughly 50bp below core. So a 2.2 percent core CPI inflation implies something like 1.8 percent core PCE inflation. That is still weak relative to the Fed’s two percent inflation target. 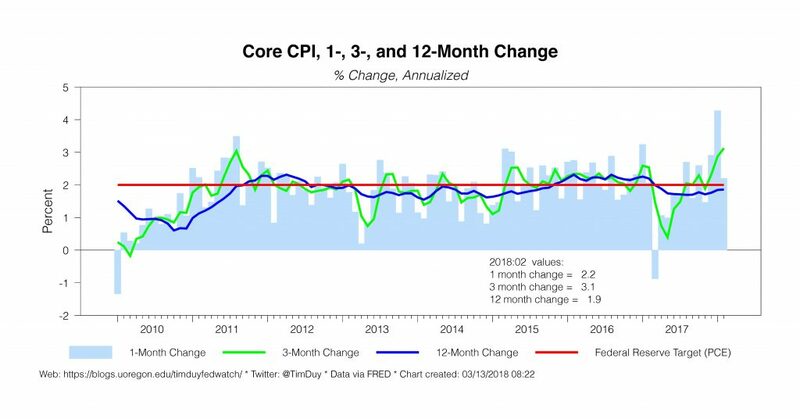 Bottom Line: Inflation numbers help confirm the Fed’s current forecast, but don’t signal any overshooting of their target yet. The Fed hence can’t yet place an accelerated pace of rate hikes on the back of actual inflation. Changes in the rate forecast instead remain attributable to risk management considerations as tailwinds threatens to push the economy into overheating that would reveal itself in either excessive inflation or financial instability. To automatically receive email updates for economic indexes, enter your email below. Professor Duy received his B.A. in Economics in 1991 from the University of Puget Sound, and his M.S. and Ph.D. in Economics in 1998 from the University of Oregon. Following graduate school, Tim worked in Washington, D.C. for the United States Department of Treasury as an economist in the International Affairs division and later with the G7 Group, a political and economic consultancy for clients in the financial industry. In the latter position, he was responsible for monitoring the activities of the Federal Reserve and currency markets. Tim returned to the University of Oregon in 2002. He is the Senior Director of the Oregon Economic Forum and the author of the University of Oregon Statewide Economic Indicators, Regional Economic Indicators, and the Central Oregon Business Index. Tim teaches a wide variety of courses, including Economic Forecasting, Evolution of Economic Thought, and Principles of Macroeconomics. Tim has published in the Journal of Economics and Business and is currently a member of the Oregon Governor's Council of Economic Advisors and the State Debt Policy Advisory Commission. He also serves as Co-Director of Undergraduate Studies for the UO Department of Economics. The Oregon Economic Forum is a series of initiatives presented by the UO College of Arts and Sciences and its Department of Economics. With the state continuing to face significant economic challenges, the Oregon Economic Forum adds a new voice to the ongoing political and business economic dialogue and affords business, finance, government, and university leaders the opportunity to explore relevant economic issues together. In addition to an annual conference in Portland, the Forum produces the University of Oregon Statewide Economic Indicator, Regional Economic Indicators, and the Central Oregon Business Index. The Forum Director, Tim Duy, also engages the community directly via presentations throughout the state and media contact. © 2019 Oregon Economic Forum. All rights reserved.